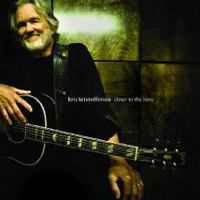 Kris Kristofferson has been astounding us with his remarkable songwriting for four decades now. Most normal people would run out of material by now. But he’s a master and masters just do not run out of material. Their minds are always clicking, their eyes are always seeing, and their ears are always hearing. They never completely stop. They may rest every now and then, but never totally stop. Such is the case of Kris Kristofferson’s latest recording, Closer to the Bone, due for release on September 29th from New West Records. The songs are simple, acoustic gems you will love from the very start. They are songs of the human condition. These are songs of undying love, songs about our demons, songs of love lost, and songs of our devotion to one another. All the lyrics are profound and poetic as is expected from Mr. Kristofferson. For instance, in "Sister Sinead" he intones; “Maybe she’s crazy, and maybe she ain’t. So was Picasso and so were the Saints. She’s never been partial to shackles or chains, she’s to old for breakin’ and to young to tame”. As you can see the lyrics are rich in texture and the acoustic guitar along with harmonica and accordion add to the texture of the lyrics. Me being a Father myself, I took a partial liking to "From Here to Forever". It’s a tribute he wrote for his children. You can tell how much he loves his children by listening to him sing his heart out to them. “I’ll love you from Here to Forever, and be there where ever you go”. It’s mostly just Kristofferson, his guitar and his harmonica, and it’s a very intimate look into his personal and deep relationship with his kids. "Closer To The Bone" features Kristofferson on vocals, guitar and harmonica, Don Was on bass, Rami Jaffee on keyboards, Jim Keltner on drums, and longtime friend, and deeply missed, Stephen Bruton on guitar, mandolin and background vocals (The record is dedicated to Mr. Bruton). Everything was written by Mr. Kristofferson except for "From Here to Forever", which he wrote with Stephen Bruton and Glen Clark. The entire album is richly produced. You would swear it came out from under your dirt covered boots; growing all around you and encompassing your body, your soul, and especially your heart. Every track has a very earthy feel to it and emotionally involves the listener on nearly every single level. This is something missing from most recordings today. Closer to the Bone was an absolute pleasure to listen to from start to finish. How could it not be with Don Was (Rolling Stones, Bob Dylan, Bonnie Raitt) at the helm? He’s known for his rich and beautifully produced recordings. His touch is present throughout. Mr. Was also produced Kristofferson’s last record, the equally impressive, This Old Road. "Rebel" Rod says to absolutely check out this gem from a master.